There’s something very special about the ritual of afternoon tea. No one is quite sure when it was first introduced in England, but the ceremony became widespread in the 1840s. Credit is given to Anna, the Duchess of Bedford, who, because of the long stretch of time between lunch and the evening meal, suffered from afternoon “hunger spells.” She remedied them with a tray of tea, bread and butter, and cake. Once she began sharing her delightful new habit with friends, it soon it progressed into a full-blown social event among the English aristocracy. The 1920s marked the height of the craze, complete with lots of guests, pageantry, servants, silver teapots, fine linens, musicians, elegant teacups, and the best tea money could buy. High tea is another thing altogether from afternoon tea, which was originally the province of the upper class. High tea is not an afternoon respite of finger sandwiches, scones, and sweets, but the main meal of the day for the working class. It originated during the Industrial Revolution for workers who returned home after a long hard day of physical labour looking forward to a hot, hearty meal. (High tea may be called “high” because it was the main meal of the day, as opposed to afternoon tea, which was also called “low tea.”) Avoid using the term "High Tea" for afternoon tea, or you will find yourself in the Tea Drinkers’ Hall of Shame! The traditional time for afternoon tea is any time between three and five o’clock. 1. In the Kitchen: The teakettle; fresh water, and loose-leaf tea. 2. 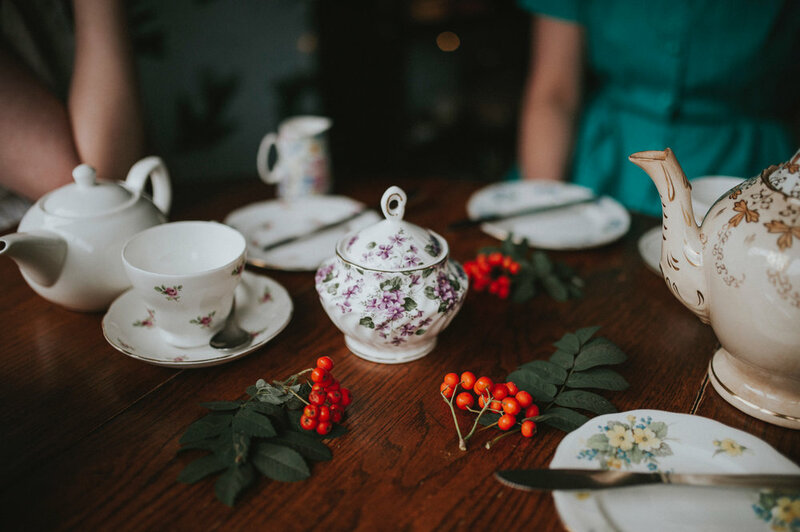 On the Tea Tray: The teapot, a sugar bowl with sugar cubes and sugar tongs, a milk pitcher, a tea strainer, a bowl for the used tea leaves, a pitcher of hot water if necessary to dilute tea to a guest’s liking, and a small dish for the lemon wedges and lemon fork. 3. On the Tea Table: Teacups and saucers; forks and spoons; small plates, linen napkins, and plates filled with tea sandwiches, warm scones, and small cakes. plus a pot of jam and another one of double cream (or clotted cream, Devonshire cream, or thickly whipped cream) for the scones. The tea tray should be placed at one end of the table. On one side, set out the teacups, saucers, and teaspoons. On the other side place the stacked plates, forks, and napkins. Plates of food go in the middle of the table. 1. Select a loose-leaf tea such as English Breakfast or Earl Grey. 2. Boil fresh cold water in the kettle. 3. Pour a little boiling hot water into your teapot and whirl it around to heat it up, then pour it out. 4. Add 1 teaspoon of tea leaves to the pot for every cup of water. 5. As soon as the water boils, pour it over the leaves in the pot. Leaving water to boil too long causes it to loose its oxygen and therefore its freshness. 6. Allow tea to steep for 2 to 5 minutes. I like my tea strong, but many prefer weaker tea. It’s easy to dilute tea to taste using the pitcher of hot water on the table. Adapted from Lisa Mirza Grotts' article for The Huffington Post.